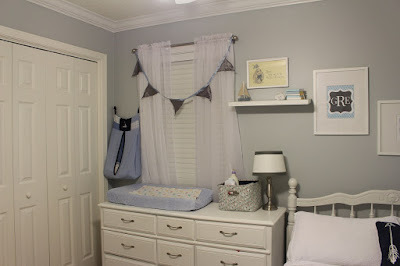 The nursery is still in a bit of a transition from Mattox to Grayson with just a couple of projects needed to finalize it. I still love the blue and gray colors and decor but part of me still dreams of more of a woodland theme. 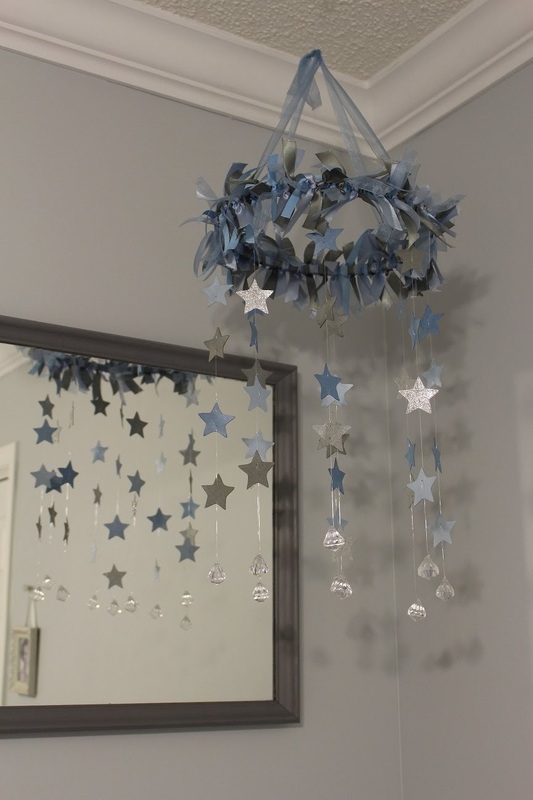 I may wait to do that in a big boy/toddler room though. For now, it is still a sweet, dreamy space in my humble opinion. 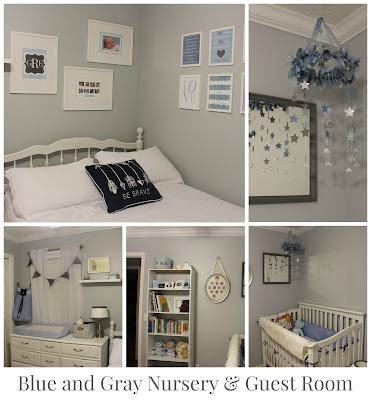 The new lighter blue gray wall color is just a bright and relaxing color for a nursery. The room isn't huge and is the smallest of all the bedrooms, but I think everything still fits nicely. The closet wasn't a walk in, but it has some great built-in storage that makes it very practical. This wall is still in transition. I have to move Mattox's 1st year frame to his and Brody's room (and add the last picture when I get it printed...sigh). Then, I have to get a new 1st year frame for Grayson which I am so frustrated will not be like the other boys' because PBK discontinued this style after many years. I actually lined up all of our boys' ultrasound pictures on the bookcase in here because I don't want anything to happen to them, and I like how they look together. I also need to get Grayson's name art for above the crib. I am going to do the same type as Brody's and Mattox's. 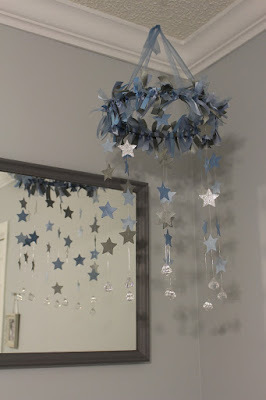 I don't plan to replace the mobile I made for Mattox's nursery as I still like this one. I still have the same white bed in the room from before with the addition of the Be Brave pillow. 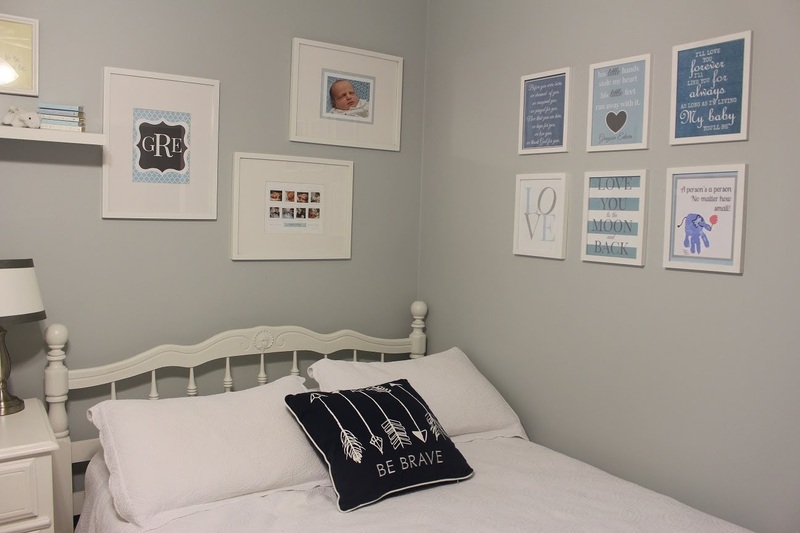 I have switched out the personalized pictures and art in the room for Grayson. I just reprinted the top center picture with Grayson's name. 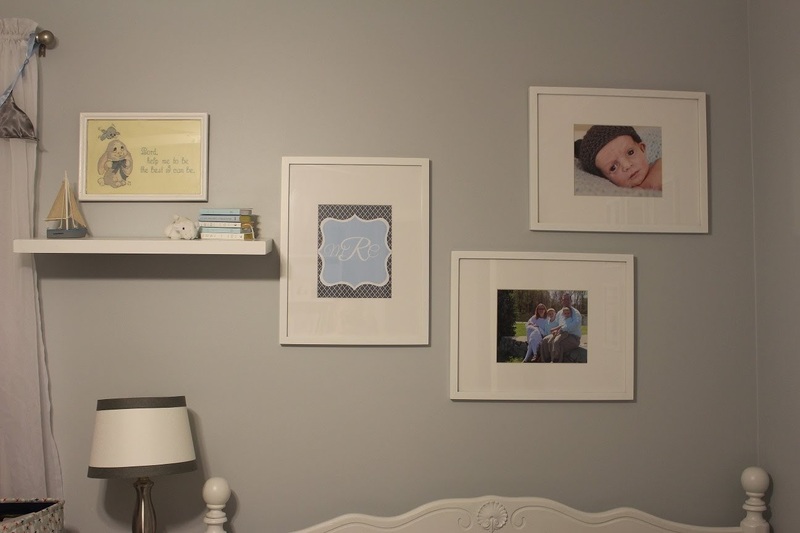 I want to get frames to hang Mattox's personalized pictures in his room. 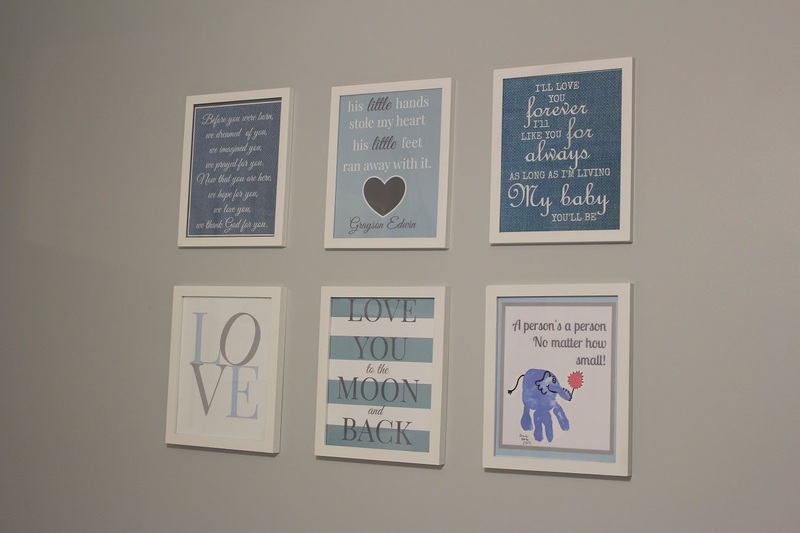 I actually ordered these art prints from Shutterfly for Grayson because they were the free gifts. They really aren't free since you have to pay crazy shipping, but since I needed them anyway, it still made sense. I created this print of pictures from Grayson's birth that I thought was perfect. I still like the simple white sheer curtains with the flag bunting I made. Most of the other changing table accessories are still the same. This "free" dresser has served us well as a changing table for three babies. We first refinished it for Brody's nursery. 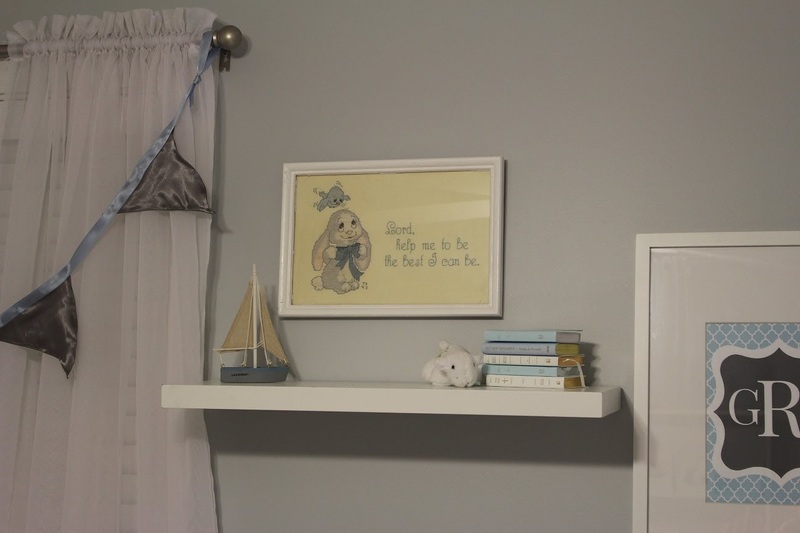 My special bunny art from my childhood collection fits a nursery perfectly. The little sailboat was a new little gift from Aunt Naomi when she visited this Spring. It says "Savannah" on it so it is a perfect addition to our new Georgia home. It is also blue and gray so it matches perfectly. I love that little stack of Bibles with each of our babies' names on them from their Great-Aunt Dava. Before I switched out the pictures for Grayson. For the last few months, Brody has enjoyed having his own room since Mattox has not transitioned out of the crib yet. We wanted to wait until the summer to do so because the big boys had to get up so early for school. Soon, Mattox will join Brody in this room. 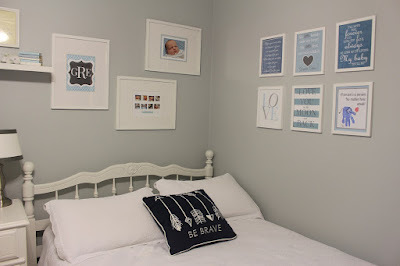 I do have a few projects I want to add to the space for Mattox like some new name art to match Brody's and some cute new sheets for Mattox. I am thinking puppies for him because he does seem to love dogs. These bunk beds have been such a wise investment. The steps are very handy and safer than a ladder, and there is a ton of built in drawer storage for a shared room. For now, Brody's name is the only one in the room, but I hope to soon have a matching one for Mattox. 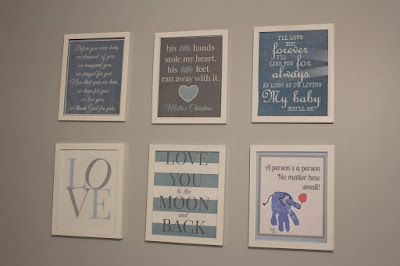 I never made Mattox his own name art because he had used Mattie's monogram in his nursery. Brody's bed. Yes, it did bother me when I realized after downloading these pictures that his pillow was upside down. Ha! Brody's sheets still seem so appropriate for him since they are the "Brody" sheets from PBK. He also still loves his old boppy pillow. Many of Brody's "big" toys are in here now, and he still loves his art easel although he could kill a rainforest with the amount of paper he wants to use. Sigh. The train table, cars and dress up clothes are also in here for the big boys. Brody's room is actually painted the same color as our bedroom and the nursery, but I think the color looks different in every room. I think it looks more gray in here. I haven't put up curtains in here yet since there are two windows now. The room faces the back of the house with lots of trees so the view is pretty and green. Brody's shelves hold a decent start to his trophy collection, his seashell collection, his coin banks, and some pictures of him. He also has a full bookcase filled with books for him and Mattox. He does have a little TV for watching his cartoons. There is only so much Disney Junior the rest of us can take. Ha! His birthday balloons added some color to the room. I have done my best to keep the train table set up correctly, but Mattox is like a tornado wreaking a path of destruction on the poor little town. Maybe one day I will turn this into a Lego table. 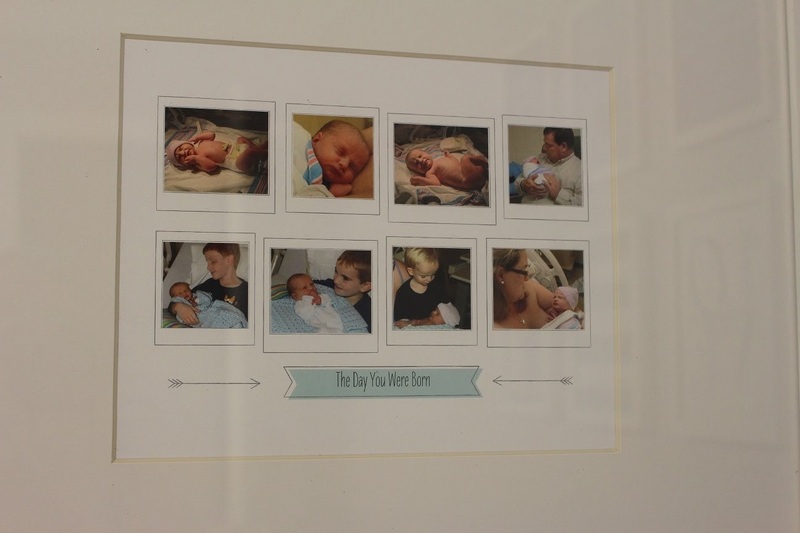 We will add Mattox's first year frame next to Brody's. I am so sad that PBK finally discontinued this style frame. I am going to have to get a different shape one for Grayson which totally messes with my future plans to line all of these up on a wall. I am so glad we have this growth chart and love seeing it fill up with the boys' measurements. It will be pretty full with all four boys on it. Apparently, Evan's biggest growth spurt was between 7 and 9. I cannot locate the papers with his measurements from 8. That was the year we had just moved from Charlotte to Holly Springs so I imagine his Daddy took them to the doctor then and probably lost it. The armoire makes a great spot for some other toys, games, and puzzles. 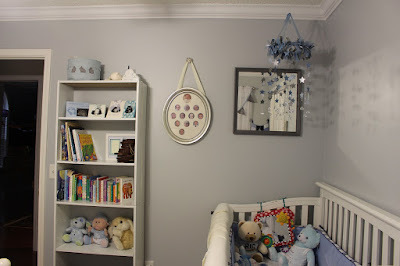 When we bought this piece for Evan's nursery, it was to hold most of his clothes because our tiny house's closets were so small that Eddie had to use the one in his room. Mattox loves Brody's magnet doodle. When we told the boys we were moving, we helped make the decision more appealing to Evan by promising him his own bedroom. In our old house, that just wasn't going to be feasible, and Mattox and Grayson were going to have to share the nursery space. We knew we wanted an extra bedroom and were very thankful we found it. Evan was very happy to have his own room again. Brody has also enjoyed his own space for a few months, but little brother Mattox will be moving in this summer when he gives up the crib. Yes, that should be interesting. 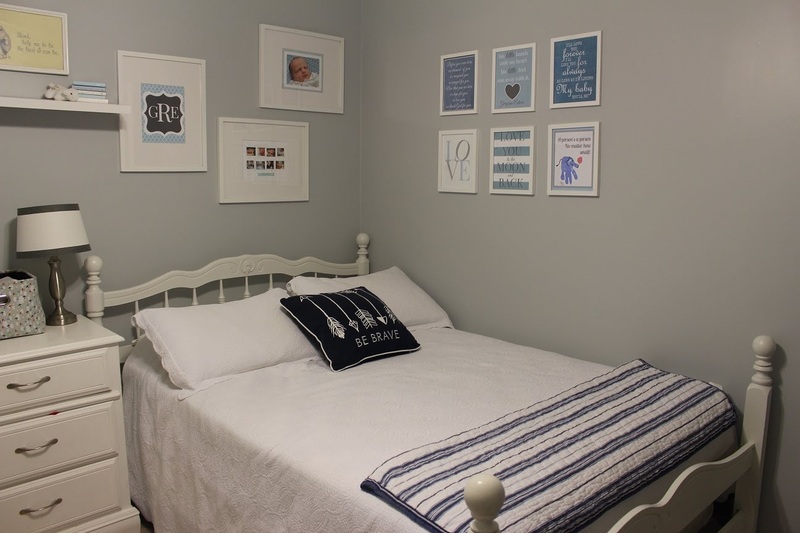 For Evan's space, we gave him our old queen size bedroom furniture. A queen size bed does seem a little excessive for a 10 year old, but he will have a lot of room to grow and can take this set with him if he wants it when he is all grown up. Anyway, I am all about using what you have to save money. He loves his big bed and grown up furniture. 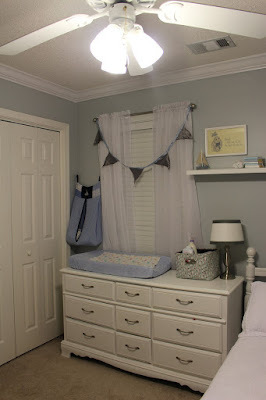 His room is definitely in the transition phase between little boy and teen boy which makes me a little sad. I am happy to leave some of those little boy objects in the room still. 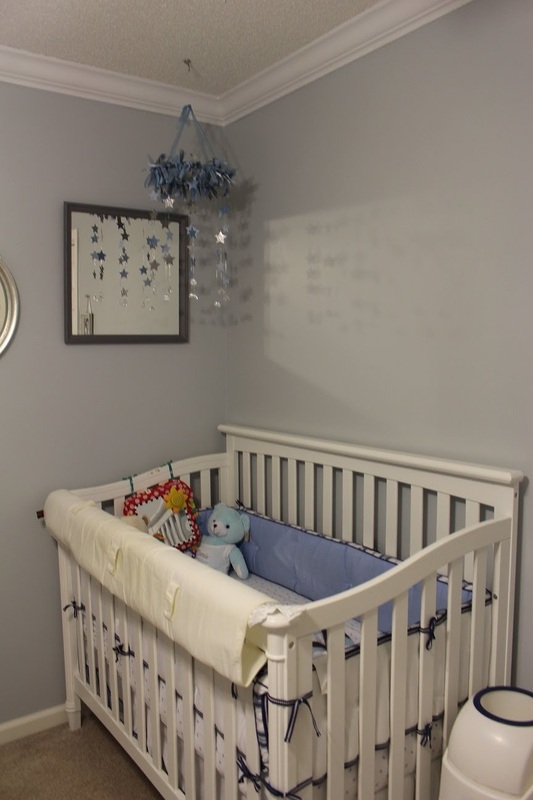 We didn't need to repaint Evan's room since it was already a decent shade of blue. I think the red accents really pop against the blue. 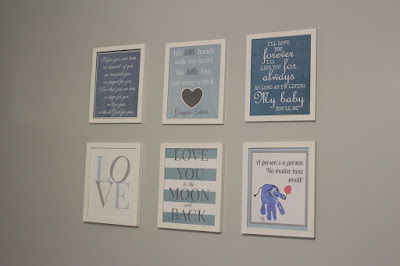 Evan's name letters go all the way back to his nursery. 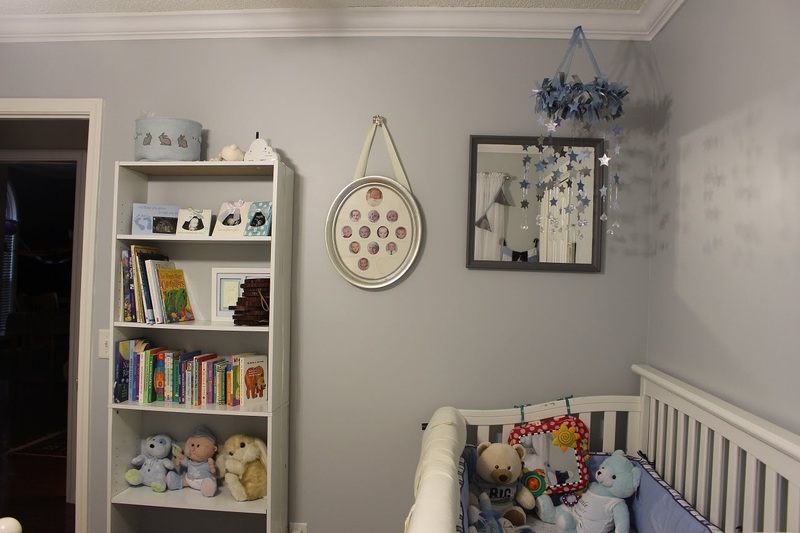 He has space to display many of his lego and other creations and trophies. For now, he is using an old bedding set that I first purchased for Eddie when he received this bedroom furniture as a college graduation gift. It is actually a really nice Nautica set, but it is a little thick for summer so we may look for something lighter. He still loves dinosaurs (especially Stegosaurus) but he says he wants to change his room to a beach surf theme. We may wait a year and see if he changes his mind. I am not quite ready to give up the dinosaurs yet. Sigh. He has a bookcase to hold all of his books and magazines. I just love that picture of him and Brody together. It always makes me smile. 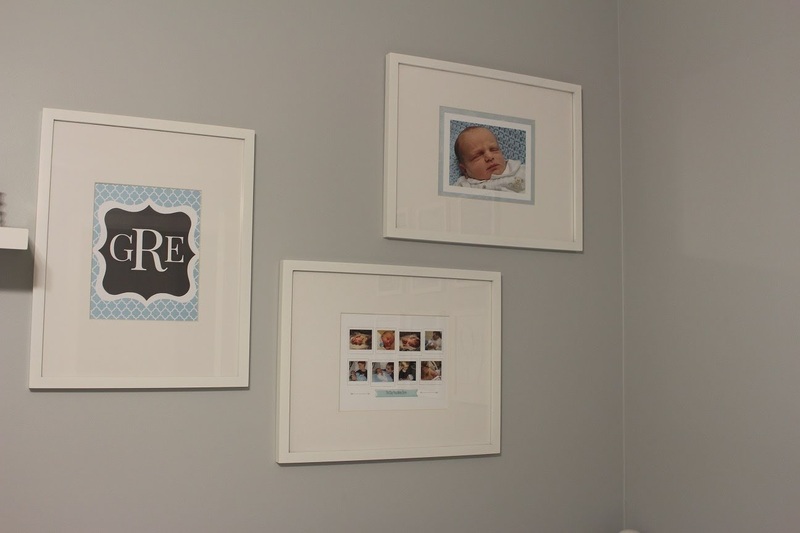 And I also love our first year monthly photo frames from Pottery Barn Kids. Sadly, they have discontinued this style so I will have to get a different one for Grayson. I knew it was going to happen one day. Sigh. His dresser is the best spot for his TV. He actually doesn't watch it much in here. We hooked up his daddy's old Playstation 2 for him in here because he started liking some of Daddy's old games. The big red chair also fit in his room, and I often find him cuddled up here playing on his phone. Sigh. That is his big addiction right now. 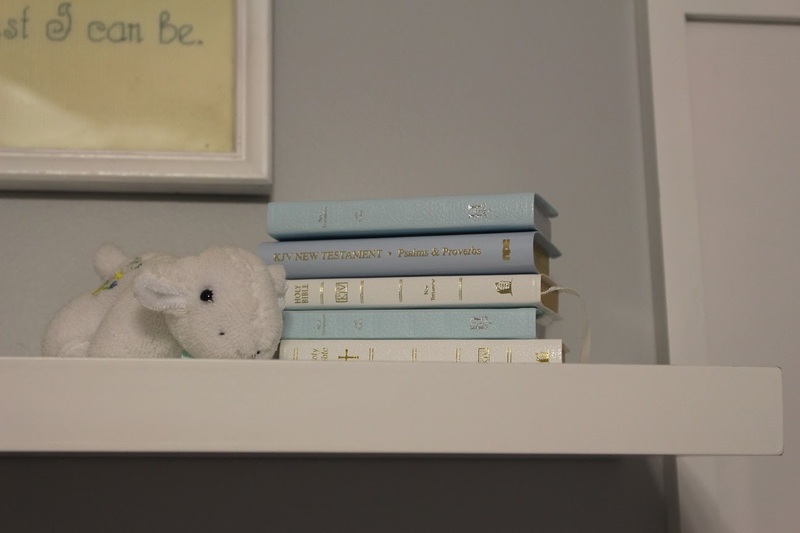 A close up of his little shelf that holds his trophies and other keepsakes. I filled up a mason jar with some of the shells we have collected over the years, and Brody wanted one too for his room. I thought he needed a desk in his room now for homework, lego building, and coloring. Brody utilizes this space too. One day, we will likely have to put a computer here for the boys. Some of the Lego sets he has built. He says he doesn't really care about them much anymore so he will likely pass them on to Brody. He has moved on to the architectural sets and finally built his Eiffel Tower one. Well, I am still behind about a month on posting, but I thought a house tour was an easier post than some of the more photo intensive ones I need to do. Apparently, we are living in the '90s here in Coastal Georgia and the internet is more like dial up. Sigh. There are basically only two options so we are probably about to switch and try the other option because this is not working. So with incredibly slow upload options, I am pressing forward. With each move, I would say our master bedroom gets a little closer to what I really want and envision. Fresh paint and some new furniture got us closer than ever before. For us, we like to save up for big stuff, but there just always seems to be more pressing needs than our home decor wants. Anyway, I hope you enjoy the tour. Our bed hasn't changed much as we still want to keep our upholstered headboard with its blue and gray fabric. We did hang the headboard pretty high and just put our wooden couples monogram above it. We haven't updated the side tables yet, but we may do so in the future to match the new dressers we purchased. We have admired that set for a while, but it is kind of expensive so buying a piece or two at a time was more practical for us. I am not sure if we will buy the bed since we still love our headboard and the bench seat at the foot. The upholstered headboard is just something we can upgrade fairly easily and inexpensively if we ever want a change. This silky blue blanket never stays where I put it with Brody the blankie stealer in the house. Here, you can see our new dresser and mirror. It is a sturdy and simple design in a dark cherry finish. I like that the drawers are all cedar lined too. Our Hawaiian tiki mask hangs over in the corner, and the canvas print has one of our favorite expressions on it. When we were dating, we would always have this little joke where Eddie would say "I love you," I would say "I love you more," and Eddie would say "not humanly possible." Maybe I should paint that on a canvas for the other side. Ha! This side has our comfy rocking chair, my wedding portrait, and a little gallery wall that defines our marriage and family. I still want a little table to put next to the chair. I also hung the little chandelier that was in our daughter Mattie's nursery in here because I wanted to see it instead of putting it in storage. A close up of the comfy chair. The kids use this more than I do. The upgraded printable of all of our birth dates. It gets pretty long with five kids. Pictures of the most important people in our lives. Got to have that TV in the bedroom. Haha! The bathrooms and kitchen are probably the two rooms in the house that need the most work. They aren't terrible, but they are just builder grade with no upgrades and still have linoleum flooring and basic fixtures that could use a refresh. I think it would be fun to upgrade these in the future as I believe this house has the potential to be our forever home. We haven't done very much in the bathroom. It was painted a very light purple gray so we could live with it for a while. I hung a little piece of photo art that we bought at Eddie's work auction last year. It depicts one of the many NC lighthouses and one that we visited a couple of years ago on Hatteras Island. This one is Bodie Island lighthouse. The tub is primarily used by the kids for bathtime so their toys are in here. Am I the only one that hates these places where they didn't want to bring the walls all the way to the ceiling and leave these "shelves." I mean who knows what kind of creepy things live up there. How often do people really clean these areas since it requires a very tall ladder to reach? Those are the two master closets and the little hallway leading out to the bedroom. My sink. I like keeping my jewelry box in here to keep clutter out of the bedroom. A very minimalist little shower. I would love to bring it out more and make it bigger some day. And lose the ugly shower doors of course. Our biggest "issue" with the bathroom is probably the lack of privacy. It doesn't have a separate toilet room with a door, and the door to the bathroom is a sliding door that is difficult to lock. When locked, our little two year old can still manage to open it. No more private bathroom time for us. Haha!